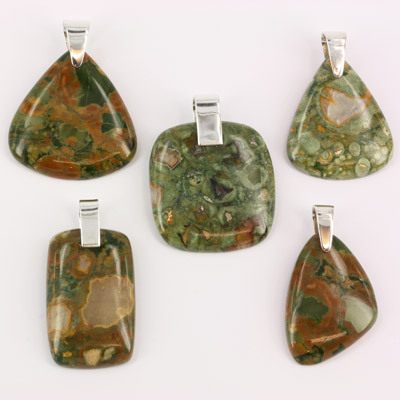 Rhyolite and Sterling Silver Pendants. Wholesale. Buy Australian Gemstone Jewellery Directly from Supplier. Rhyolite or spherulitic rhyolite occurs in volcanic flows of lava. One of the nicest forms of spherulitic rhyolite is found near Mount Hay in Queensland, Australia. It is very colourful with many green, yellow and orange tones. 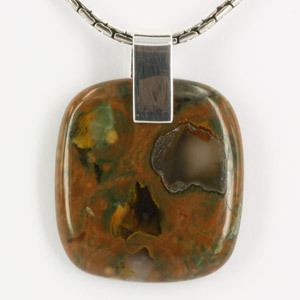 It is marketed under many different names, the most common being rainforest jasper.